In 2010, we attended the presentation of the Aquisição Arquitectura Award to the renowned architect, Manuel Vicente, by the National Academy of Fine Arts. Having received training and worked in several countries on different contents, the Master declares he has nothing to teach. And he continues to believe this, at least when it comes to the inventive capacity of present and future architects, rather than techniques and formal methods which can be learnt anywhere. Yes, I even worked in India and Macao, after which I worked in Madeira for a year, before going to the United States. It was 1968, it was December that year when I left; I was 33 at that time. In ‘61 I was in Goa, then in ‘62 I went to Macao, in ‘66 I returned to Lisbon, in ‘67 I went to Funchal for a year and in ‘68 I went to study in the United States. This is where you got to know the prominent figures in the world of American architecture as well as on the global stage, such as Louis Kahn and Roberto Venturi. In what way did contact with these architects and with a body of work that sought to go beyond the dominant modern movement influence the uniqueness of your work? When I went to the US, to join university, I had already overseen the construction of a significant number of buildings that, let us say, considered different and varied uses, with different agendas. My training here in Lisbon was based on the architectural training that was common to the whole of my generation, greatly influenced by Italian architecture. This generation had sought inspiration in order to better get to know the modern movement, or to try to establish some kind of antithesis within its certainties. And it achieved this, in the end, with the rediscovery of Frank Lloyd Wright. And it was that mixture, that new attempt at a synthesis, that formed the basis for the training my generation received here in Lisbon, which was also highly centred on the influence of the atelier of Architect Nuno Teotónio Pereira. We continued to encounter and explore new languages coming out of the modern movement that held on to the modern movement as their base, while trying to break out a bit from that tight embrace, that highly rigid theoretical framework in which it found itself then, and which left little room for research and reflection. Later, in India and in Macao, I was exposed to different realities, more so in Macao, from ‘62 onwards, where I had quite an active professional practice, which enabled me to explore, so to speak, the thread of that formal and theoretical discourse. The subsequent encounter with the America of Louis Kahn and Venturi helped enrich this perspective, but was not its birth. It was the deepening of my own reflections on architecture, which I had been doing through professional practice and constant reflection. And that encounter with these different realities further defined the path that I have followed. In that sense, it wasn’t a break, but a continuation. In what way did this path and the experience of that generation mark your critical analysis of contemporary Portuguese architecture? Leaving home always gives you some more space to imagine, as you are no longer confined, and we must consider that Portuguese aspirations are a lot more cosmopolitan now, although still not as open as one would like. At that time there was still not much openness, added to which was the power that established practices have... but at a certain stage there is a kind of canon that gets established. And it’s not easy, at the level of our environment and in the power bases that are established, among critics, opinion makers, the media and other circles, a person begins to doubt these certainties. Thus, those who stayed back in Portugal remained greatly attached to certain canons and dogmas, some of these related to what was commonly known as the Porto School, which was, shall we say, quite a puritanical school, with personality cults, which ended up creating a somewhat closed world, although formally modern. They were not old-fashioned, they were not trying to relive an identifiable past, as was the case with a lot of architecture from Salazar’s time, which sought a return to the Portugal of King John V and what they considered to be “Portuguese architecture”, rooted, sustained without any formal discourse... But this architecture, which got established here had that same longing with regard to what would be a kind of institutionalised modernism, in a way. Later there were were some unconventional constructions in Lisbon, or those seen as such, such as the work of Tomás Taveira, of whom I’m not such a fierce critic. I find many of the things he did quite interesting. It’s not my style, but within his personal contradictions, he liberated Lisbon during a certain period when the orthodox modern movement, with its references to north Europe, was dying out. Still within the framework of reflection concerning the modern movement, what stands out from contemporary Portuguese architecture? I feel that we have an architect who is without doubt an exceptional man, who has moments of genius: Álvaro Siza. Not everything he does is extraordinary or perfect, but a large part of the things he does are greatly stimulating and really interesting. But, in these last ten years, he has also left Portugal, and I think he would have evolved a lot more if he had not remained so confined to a model where he was sought to be imprisoned; not deliberately, I’m not saying that anyone was violently forced, but rather by circumstance, Siza Vieira was reduced to a caricature of himself, thanks to others, and he almost could not find the space to follow his own line of reflection or continue his personal reflection as an architect. But I feel that, happily for him and for us as well, he has managed to free himself from the mould that sought to constrain him. Portuguese architecture is conformist architecture, where there is always a tendency to follow, in the end appearing somewhat structured, configured. But some areas experience greater freedom of Portuguese creativity. I’m talking of painters, musicians, writers, who in spite of everything are not as constrained. There are not as many figures, not so many untouchables in Portuguese music, nor in literature: we have a world of freedom in Portuguese literature, with great variety, which is also the case with painting. I’m talking of people like Julião Sarmento as well as Noronha da Costa himself, who is no longer as much in the spotlight, but who was also a very independent man. Are you saying then that the architecture of today does not prize originality very much? Architecture remains very structured, let’s put it that way. I feel that in a more cosmopolitan space such as Lisbon, it would not be possible for anyone to be beatified, as happened in Porto with Álvaro Siza, who is in a way untouchable, or a bit unquestionable. In Lisbon, there isn’t much that is not questioned. Because there is also this idea that in Europe we have the capital cities on one hand, and on the other the big cities, and that the capital cities are always freer and more cosmopolitan that the big cities. I could compare or equate Porto with Barcelona, Marseilles, Lyons or Milan, or similarly, Lisbon with Madrid, Rome, London and Berlin (with that dimension of greater complexity, variety and stimulation that capital cities have). There are countries where this is not the case – in the US, for instance, the city of New York is much more important than Washington, and in Holland it is Amsterdam that is more important than the Hague. But this rule of the capital versus the big city helps us understand this European world in which we live. And we can see that there are always great untouchables, and that big European cities almost always have their own, and that this happens to a lesser extent in capital cities. Throughout your professional life, you always reconciled an Architect’s career with an academic career which has had a strong influence on young architects. In this process of transition, what were your major concerns? I really like teaching, but in architecture I don’t particularly believe in theoretical training. I greatly believe in stimulating students’ imaginations, because we always have inside us a multitude of things that we cannot even imagine. And great learning takes place as a kind of revelation. It can happen in contact with people or with a book, but is a revelation of one’s self, and not the acquisition of something from the outside. From what we hear and read, we can say “this is it, this is exactly how I think, but I hadn’t found the words to say it, or I hadn’t heard it expressed so well”. And what is necessary is to allow this to be said, to verbalise an inner richness that is made up of our memories, the contacts we have had, what we have seen and how we have reacted. I give great importance to memory and imagination. Presently, I give classes in Design to second year students at the Autonomous University, and a few days back, we had a presentation of an exercise; it gave me great pleasure to hear some people question themselves about the origin of all these ideas: they had it in them. This is why I like to teach. In this process, what I receive is much more than what I give. It’s a bit like gardening, you plant some seeds and then in spring you have these enormous things, tomatoes, turnips, lettuce... and everything began with a small seed. It always fascinates me to see people discover themselves. And I try to help them, in small ways, so they can find their path. A large part of my work as a professor involves accepting what the students wish to do, and participating to make sure that what they eventually do is as close to what they wanted to do. It’s got nothing to do with them doing what I tell them to, but that what I say helps them do more than what they were doing before. I frequently tell my students: “I have nothing to teach you, nothing to teach anyone”. What I have to offer is my assistance in helping them perceive what they want, entering into synchrony with what they’re looking for and helping them get there. It is great fun for me as well. When students approach me there is always something new for me, which leaves me content as well. If it was only me doing this alone, it would not be as interesting or as stimulating. The others are a part of my life and a source of my happiness. I’m not by any means a solitary man, or a loner. Your career has, as we have seen, taken you places, studying, executing projects and giving classes. In this transmission of ideas, what do you feel is fundamental to pass on to your architecture students? I feel that what is most important, as in any other field of artistic activity, is to have work, to be in demand. Afterwards, I often tell my students that difficulties are the architect’s best friends, as they force them to make an effort, due to the need to overcome situations that seem difficult to solve and that encourage our creativity, our capacity for invention. This do or die attitude becomes an inexhaustible source of discovery and inspiration, sometimes suggesting things that were earlier considered unthinkable. Let me give you an example: there was a project that was developed by a young architect who was working with me. It reached a stage where the project was ready, but no one had realised that it did not fit in the property. The fault was mine, as I should have taken care of this earlier, but I had faith in the work of that architect. When I noticed the problem, I started to think about what to do. The property had a street on each side, and a suggestion came up that the street itself could go through the construction. And this is what happened – we adapted the construction to the ground situation, but in this case, only at the end of the design stage. This unexpected, enforced event, proved to be an extraordinary benefit for the culmination of the project, for its integration in the city and for the course of that street, which became more interesting, as did the construction itself. And rightly so. Now, if we hadn’t experienced that difficulty, I don’t think I could have arrived at that idea on my own, as it seems a bit perverse to have a street inside a building. Anyone would think that to do such a thing would be like a shot in the dark. But later you come to realise that it’s a good idea, and you’re happy. This is why I say that difficulties are generous, life is generous and that we must not be afraid to keep at it because it is always worth the trouble. It has nothing to do with an architecture made up of certainties but an architecture built on surprises, on the way one deals with them, which is why they are always welcome. And does this flexibility work today in bathrooms? How do you view the evolution of architecture in these spaces, which are as important today as any other part of the house? It’s interesting, because I have a very personal and particular relationship with bathrooms. I feel they are increasingly comfortable and well designed, and they are not spaces designed to simply be pleasing to the eye, but spaces that one is happy to be in, spaces that form part of enjoying life. I have always imagined – I’ve always had to imagine – spaces where I myself would like to be. In my first project, which was an extensive remodelling of my parents’ house, the bathrooms were spaces that received particular care, all of them. These were spaces where one could be at ease, not strictly functional places where one entered and left without spending much time. At times, in a large house and with many people, bathrooms are also places of refuge, even when they are not needed for anything else. This is one of the most private spaces in a house. So much so, that in Brazil, they are even called “a privada” (the private space). It is also a place where we perform duties in addition to those linked to physiological needs, which are linked to pleasure and enjoyment, such as the bath (even if it’s only a shower); some people whistle, others sing... the bathroom is a space for rest and relaxation, and all of us often end up spending more time in them than is needed. And what aspects do you value more in these spaces, design or function? Natural light, sophisticated solutions... what elements are indispensable today? I feel that comfort is the essential aspect. I remember that, when I got to know the Architect Fernando Távora, he had finished performing an extensive remodelling of a very pretty house, which had been his house his whole life. It was in Foz, a corner house, very low and enchanting. As part of the remodelling that he had done, Fernando spoke to me of his relationship with the bathroom (and this took place 50 years ago, in 1960), and he told me: “I always wake up moody, and hate having to go to a place that is completely white and full of light, cold and unpleasant”. I feel strongly about this with regard to bathrooms, that they should not be very aggressive spaces, and I don’t know if design, as it is understood, gives that much importance to this. At times it creates coldness, distance and aggressiveness. At times there is so much design that a person enters and only sees the ceramic ware, the basins, the washstands and the accessories, and all of this receives disproportionate importance. It’s a bit like a woman who, in order to be really well dressed, must wear a minimum of jewellery. What sanitary fitting do clients give special attention to? I feel that the bathtub is the most important fitting for many people. I find that these days, with the absence of domestic helps, fittings that are supported on the wall are a great idea, for the ease of cleaning the floor. I feel that a shelf attached or very close to the washbasin is a good idea because these days even men use cosmetics and there is always a paraphernalia of bottles and objects which a shelf makes easy to access. Having two washstands is also comfortable, particularly for a couple, as it provides comfort. 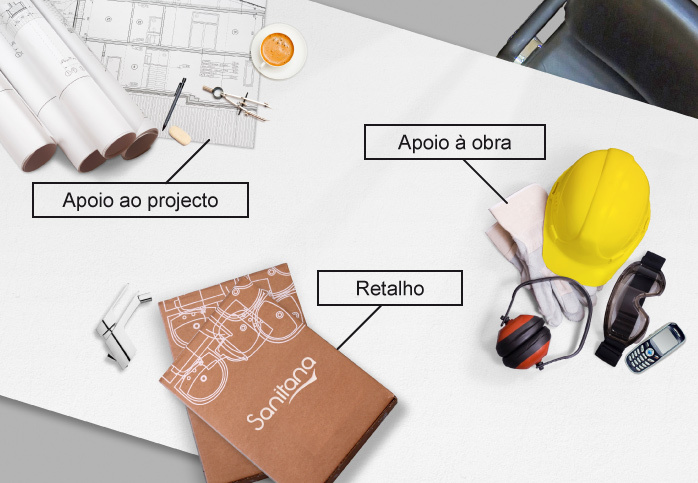 In your projects, do you select sanitary fittings by specific brands or by type? It’s more by model and type of the fitting. These days, practically all brands have interesting models. I remember that in Portugal, at one time, the market was invaded by a Spanish brand, which led to an evolution and gave rise to the creation of more interesting designs. I remember that when I worked abroad, English brands were highly esteemed, and that in Macao we had a lot of American Standard. It’s a world that was never abandoned. There is a complete production and marketing process that invests in the strong relationship that everyone has with the bathroom. When it comes to materials, what style do you prefer for bathrooms? I was never a minimalist, thankfully. I feel we need spaces to rest and observe, we need different points of view and things that do not reveal themselves at first sight. Therefore, I defend a certain excess of function, or a minimum of affective investment or even unnecessary objects. I believe that the unnecessary is necessary, as no one can live as a skeleton, you need to have a bit of flesh. And then there are materials to which we always give attention, such as ceramic and stoneware. Metal is pretty at times, but is too cold. I also remember the old bathrooms where the floor is made of wood, which is very comfortable and inviting. I feel that this is a bit subjective, but the bathroom where I feel most at ease is mine, naturally. I remember a project where the client told me that he wanted a modern house, which included a kind of bathroom that went well with these taps decorated with golden dolphins; this kind of decorative element was much the rage in the 70s, and gave rise to an idea of luxury identical to that of oil magnates. I immediately realised what kind of bathroom the client wanted (although he had not imposed a bathtub of this or that shape or size); he has remained happy with it till this day. In this sense, I feel that there was agreement: I recognised the relationship he wished to have with the bathroom, which must be elegant and comfortable at the same time, and I created a space that corresponded with his fantasy. Therefore, architecture projects always have to be something executed with ingenuity and versatility. And was this one of your greatest challenges, in terms of professional achievements? That wouldn’t be my greatest challenge, as I said earlier, the first bathrooms I designed were in the house of my parents, whom I loved them, as they loved me. I’m also quite fond of the bathroom I designed in my house in Macao. Basically, I feel I like all the bathrooms I have designed. I have always made them with great pleasure, it was never a matter of finding a solution where I put together a commode, a bidet and a washbasin, yet another corner to fit a shower in; all of these things were always done after great thought. I have always designed spaces that I myself would like to use I don’t know how to execute projects for places I would not like to be in. Once, one of my partners wanted us to enter a competition for the Republican National Guard – this was after 25 April – and I told him that I cannot design barracks, or police stations, or prisons. Because those are not places I would like to be in. In conclusion, I don’t know if there are too many architects who particularly like bathrooms. I say this because I find that many of these spaces end up being places that are not spaces to be lived in, nor spaces for being, but simply spaces to be used. As for me, the bathrooms that I create are always made to spend time in, in addition to being spaces to be used.